JanRep Associates is a manufacturers’ representative company founded by Roger Hunt and Tom Landsberg in 2000. 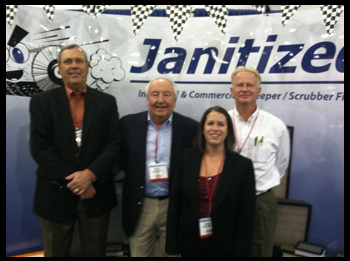 JanRep is hired by manufacturers’ as an alternative to a direct sales force. We sell to distribution in the JanSan, Industrial, and Foodservice markets in Kansas, Missouri, Southern Illinois, Memphis Tennessee, Nebraska, Iowa, and Colorado. Roger has been in the JanSan Industry since 1972. He worked for 12 years as a direct sales rep for 3M and then for 14 years with Continental Manufacturing. In 1998 he started JanRep Sales as an independent rep, and then JanRep Associates in 2000. Roger is known for his tireless work ethic, persistence in his territory, and close ties to his customers. His slogan is “TCO”, Taken Care Of. Tom has been in the JanSan Industry since 1977. He worked for 2 years as a direct company salesman for Rubbermaid. In 1979 he started Landsberg Associates an independent rep company. He and his salesforce represented Rubbermaid for 21 years, Tenant for 12 years, among various other manufacturers’. In 2000 he began JanRep Associates with Roger. Mark has been in the JanSan Industry since 1990. He started as a cleaning contractor, in 1993 he joined Century Labs, and in 2003 he moved to Massco. He joined JanRep as in independent sales rep in 2010. Mark has worked with all segments of the industry specializing in contractors and schools, he has also worked with industrial, and health care. Lisa joined JanRep Associates in 2001. She is responsible for office operation, marketing, bookkeeping, and sales support. Her organization, communication skills, and project management are an imperative part of JanRep Associates day to day operation.